A few easy suggestions for how to stop your computer spying on you. Most people don’t realize that Facebook can continue to monitor their internet activity, even if they are no longer logged into the site. Using “Facebook Connect,” and other social plug-ins, Facebook is able to set up a cookie on any site that has a “Like” or “share” button, giving Facebook access to a startling amount of user information. Technically, the purpose of these plug-ins is to authenticate users, but it still has the ability to collect personal information such as the IP address of your computer, browsing data, outside login information, phone numbers, etc. To help users control how and when their information is tracked and distributed, companies such as Abine and Ghostery have developed tools that allow users to block Facebook social plug-ins, cookies, and other trackers. We identified five practical options for consideration, including an option for web site publishers that will help protect their customers from trackers while keeping their websites running smoothly. 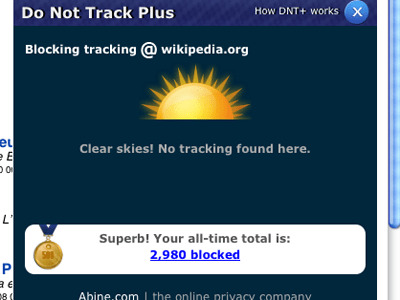 Do Not Track Plus — A browser add-on that will identify and block trackers. (DNT+ website)As Business Insider previously reported, Abine’s DNT+ tool is a FREE add-on that monitors, tracks, and allows users to block any trackers and requests that may be following their internet activity. It is compatible with MAC or PC for Chrome, Firefox, Safari, and Internet Explorer. It is currently able to block more than 600 trackers, and automatically updates to catch new trackers. Ghostery is similar to DNT+ but this add-on is also available for Opera. 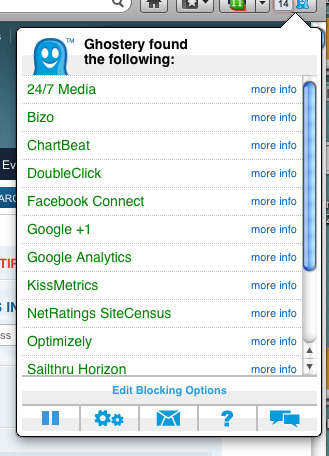 Similar to DNT+, Ghostery is a browser add-on, owned by Evidon, that protects consumer privacy while online. By giving the consumer visibility into who is tracking their online activity and allowing them to block all or specific trackers, it empowers users with the ability to stop third parties from collecting their personal information without permission. It currently has more than 16 million monthly users and pulls data from over 26 million web domains via an opt-in service of 7 million users. Ghostery is free to download, free to use, and does not contain any adware or spyware. It is available for all major browsers: Firefox, Safari, Chrome, Opera and Internet Explorer. 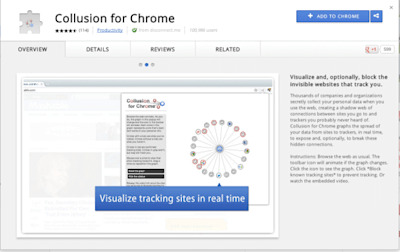 Disconnect and Collusion for Chrome — A robust tool that will identify and block trackers, but is only available for Chrome. Similar to DNT+ and Ghostery, Chrome Disconnect allows you to stop third parties and search engines from tracking your web activity. Specifically, this tool focuses on allowing users to disconnect from sites such as Facebook, Digg, Google, Twitter, and Yahoo without risking the performance of the sites. The tool blocks identifiable cookies while allowing you stay logged into various sites. This site allows users to then see which third parties are tracking them by graphing the spread of the data from sites to tracks, exposing them, and giving users the ability to block the trackers. Consider adjusting browser settings to control trackers. Before downloading yet another piece of software on your computer, consider simply adjusting the settings on your browser. Firefox: Firefox> Tools> Options> Privacy> click the box that says, “Tell websites I do not want to be tracked.” Then you should set it to “never save your history” and remove cookies frequently. Safari: Safari> Preferences> Security> Accept Cookies> select “never.” You might also want to consider browsing privately so your history and passwords are not stored, and thus accessible. Internet Explorer 10: Microsoft’s latest version of Internet Explorer 10 will default to a “Do Not Track” position. The browser will send a signal to advertisers altering them that users do not want to be tracked. Stop it before it starts with Evidon — A blocking and tracking tool for web publishers. 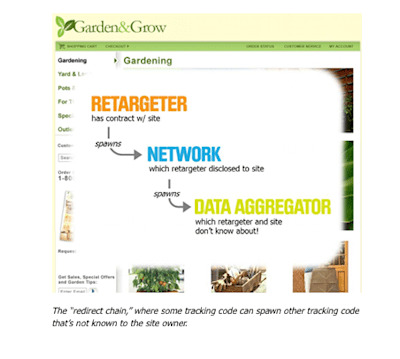 This product is designed for website owners who want to keep the intentional tracking code on their sites from spawning additional code from third parties. It allows websites to see all trackers and how they are affecting the site’s performance, while securing the site’s customer data. This is a tool designed specifically for web publishers to help them both comply with privacy regulations, ePrivacy Directive and “AdChoices” self-regulatory programs, and protect the private information of their customers. In addition to showing all of the trackers on a site, and where they are originating from, this tool also alerts web site owners of everything that needs to be disclosed to consumers about how their information is being used. Well done to Business Insider for publishing such a useful article with great links. I suggest you employ one of these means to stop peopleyou don’t want to know your private business, er, knowing it.